Decks today are the focal point of most backyards, as the trend towards outdoor living continues. Deck designs focus on private family time and with entertaining in mind, and are becoming the single biggest investment in your home. Make the wrong choice and a deck can become the most frustrating, time and cost consuming aspect of your life. In our climate, the sun and weather will break down any material – some faster than others. The sun will bleach colors, warp boards, and the weather will impart stains, cracks and other defects. Wood and plastic are organic materials that are known to decay under the effects of the weather and sun – this is inevitable. So for decking, a whole industry has been developed around fixes to delay the inevitable decay of these materials. And be sure to check the warranties – most warranties for treated lumber only cover against decay and termites, not appearance. And warranties for plastic or composite decking have similar warranty restrictions, with some actually exclude the effects of the weather and the sun. Think of your automobile. The auto industry has the greatest R&D capability on the planet – yet your car’s paint job (i.e. a plastic compound) is only warrantied for 8 years. Some may remember cars have a vinyl roof – note this feature has long been abandoned. Steel and stone are the only materials known to withstand the effects of the weather and sun for decades. These materials come with proven performance. These materials are the only true maintenance-free materials. Your home is built first as a structure, then finished to suit your aesthetic needs and tastes. We would not think of combining the finish with the structure, unless we wanted to be locked into a look for all time. When we remodel a home, we generally renew the look, not the structure – right? A PAVERDECK™ is designed this way. 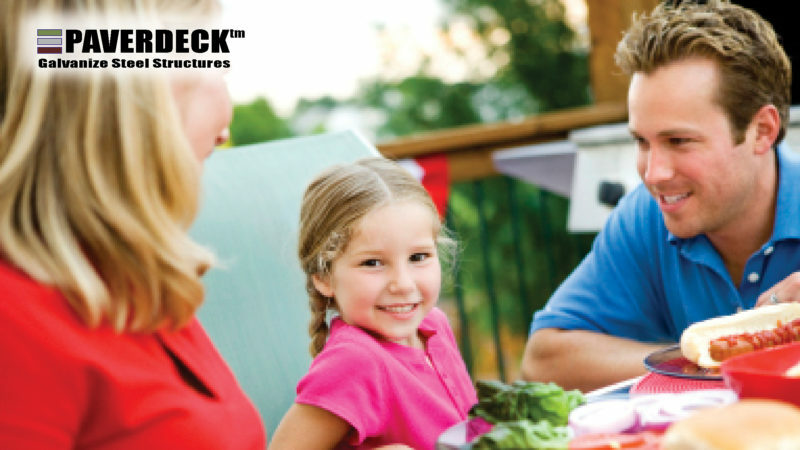 PAVERDECK™ is the only deck with a complete galvanized steel structure to support all loads – including the surface. The steel panels are the complete structure and require absolutely no maintenance to survive a lifetime. The surface finish is not part of the structure and is chosen based on deck design and budget. Natural stone pavers have no warranty, although most concrete pavers are sold with a lifetime replacement warranty. What happens if a paver cracks or becomes stained by accident. A field paver can be easily removed and replaced for little cost. Compare this with trying to replace a single composite deck board and trying to match the color. With a simple paver, the material costs of a PAVERDECK™ and a traditional cedar wood or composite deck are comparable. A PAVERDECK™ steel structure costs more than pressure treated structures but concrete pavers are very cost competitive – ranging from $2 per square foot. A concrete paver requires no maintenance to achieve its lifespan. Some people choose to seal the pavers to prevent stain penetration – which then makes it a low-maintenance deck finish, as sealing would need to reapplied every 3-5 years. Customers have recently been installing inexpensive porcelain tiles to the Paverdeck structure with good success. Our galvanized decking kits retail from $10 per square foot depending on current specials and layout complexity. From a materials cost perspective, a PAVERDECK™ generally costs the same as a traditional deck – as low as $12 per square foot. But over its lifetime, PAVERDECK™ is actually less expensive than a traditional deck.